Smartphone playing very important role in the business industry and usage of the mobile app is increasing daily, so it’s right time for MLM companies and owners to enter towards MLM application for the business and this will improve your user experiences, reliability, reputation, and more. So we developed an advanced MLM Android App for network marketing companies to empower the business to the next level. They are mainly four registration process is available they are basic, personal, nominee and membership information. The user can register and login with the valid username and password. The visor can easily manage their profile, commission, membership plans easily in our application. In the home page of our Binary MLM Android Application there will be the navigation menu which follows home, my account, down the line, payout, wallet statement, products, about, contact us and log out option. The user can see the information like profile id, name, sponsor name. The visitor checks the details of the people who joined under the user and this page contains the separate list of renewal and non-renewal list of down line and also overall payout details, overall purchase details and payout list. At the bottom page, there is the button to buy the product, by clicking the products, can see full details of the product and member need to buy any product to change the membership. 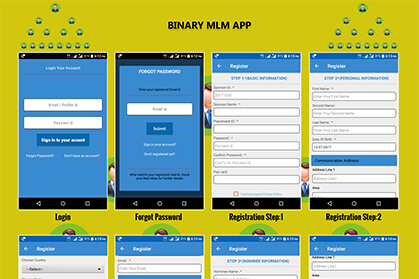 The important features of our Multi Level Marketing Apps for Android are simple login and registration option, simple and easy way to learn, membership plan, downline management, payout details, withdrawal request, wallet statement, product management, detailed product information with images, purchase list, profile management, upgrade packages, report management, advanced dashboard, attractive and eye-catching user interface, standard coding, and many more. The customization of our Multi-level marketing mobile is possible according to the client business needs and goals. The major advantages of using our mobile App are cost-effective, increase member engagements, the constant reminder of your MLM business, and more on. The MLM mobile application is developed in Java language with standard code, so its, more secure to use and safe from malware. Phpscriptsmall is the pioneer in the MLM software industry for the past sixteen years to provide MLM App for the business. We have a professional and experienced web designer and developers to builds the app with secure, user-friendly business-related model and our application help to expand your network marketing business into next level. User can easily manage the wallet details and withdrawal controls as an admin. Thank you for this wonderful Android Application. My long time goal fulfilled through this application to start a business. really I got anopportunity from you guys to enter into a state of MLM business.